Before proceeding it should be noted that the most recent work of Bruno Latour (2002, 2005) suggests that he has taken up many of the insights of phenomenology in his ongoing work. Thus, the later Latour (2002, 2005) can be seen as a bridging figure between the constructivist tradition and the phenomenological tradition (for more detailed arguments in this regard refer to Graham Harman’s (2009) book on Latour’s metaphysical ground). Two pieces of odd news from Slovakia, where Western supermarkets have made major inroads in recent years. Last week the German-owned Lidl firm caused an uproar (at least in the art community) when it knocked down a public sculpture from the 1960s (entitled “Time,” by the sculptor Jozef Jankovič) in Bratislava, in order to make way for a new store. Apparently the authorities that gave the building permission did not see any artistic or historical merit in the work either. 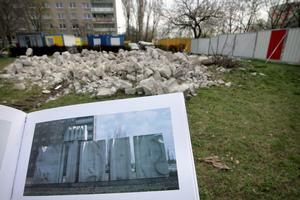 The art community and the sculptor only found out about the demolition after the fact. This raises some questions about both the “corporate social responsibility” of Lidl when it comes to shaping urban environments and dealing with the cultural heritage of host countries, and the ways in which artistic merit and historical value are established in post-communist countries like Slovakia. The other bit of bizarre news comes from the Southern Slovakian town of Dunajská Streda (or Dunaszerdahely in Hungarian), where the British-owned Tesco supermarket removed the chairs from the cashiers for two weeks, forcing them to stand for 7-8 hours a day. Apparently this was meant as a form of punishment because the checkout assistants weren’t quick enough to jump on their feet to stock shelves when no customers were around. There was also a bulletin board where the names of the least productive cashiers were displayed in big red letters to name and shame them. It is quite ironic that these emblematic institutions of Western capitalism are engaging in practices that remind the locals very much of the good old communist ways. Though to be fair, the Tesco solution did sound like it was the adoption of a local idea, and Lidl’s local developer didn’t seem to have second thoughts about knocking down the sculpture either. So this might be more about a ‘happy’ coming-together of Western capitalist and Eastern communist attitudes, practices and values for the common ‘good’ of supermarket productivity. Graham Harman will be giving a talk entitled “Things and Practice” at the Institute for Science, Innovation and Society (InSIS), Said Business School, University of Oxford on 11 May 2011 at 3pm (in the James Martin Seminar Room). García Díaz, P. (2011). “Object-Oriented Philosophy and the Comprehension of Scientific Realities.” Athenea Digital, 11 (1): 225-238. In this essay I focus on Graham Harman’s Prince of Networks, the first treatise entirely devoted to address the metaphysics of Bruno Latour. I explain how Harman highlights the philosophical roots and principles of latourian object-oriented philosophy. Furthermore, I analyze how Harman emphasizes both a new secular occasionalism as well as the new form of realism within Latour’s conception of reality featured as relationism. Besides, I also stress that Harman does not only defend the philosophy of Latour enthusiastically. This philosopher compares his own metaphysical commitments and his fourfold theory of reality to the one-fold theory found at Latour’s philosophy. Finally, I assess Harman’s review of Bruno Latour’s work and I argue that some problems within Latour’s conception of reality are better understood when they happen to be explained in terms of the philosophy of science. I tackle briefly this task in what concerns the very comprehension of Latour’s occasionalism. The Digital Methods Summer School, now in its fifth edition, trains post-graduates, PhD candidates and motivated students and scholars in how to undertake Web research after cyberspace. The idea of “after cyberspace” is an invitation to think through and study the web without resort to the traditions informing “virtual” and “cyber” corporality, politics and identity. Rather the web, first with locative technology, later with language and national webs, and more recently with college and corporate networking software (Facebook, LinkedIn, etc.) continues to be grounded. The application deadline is 8 April 2011. Candidates will be informed on 15 April 2011. You are currently browsing the ANTHEM blog archives for April, 2011.